What is the cost of a climbing permit? Climbing permits cost $15 per person, with a one-time reservation fee of $6 per transaction. Can I buy permits for everyone in my climbing group? As one of the changes in 2019, only one (1) permit will be issued per Group. Each Group may be between 1-12 people. Permit Holder (the purchaser) must know the names of each person in their climbing group at the time of purchase. The Permit Holder must be included in the climbing group. Once I purchase my permit, what do I do next? The Permit Holder will receive a confirmation email with instructions on how to access your permit. The permit can only be printed within 14 days before the date of the climb, which is accessed through the Permit Holder's Recreation.gov account. Take note, the permit can only be printed or downloaded ONCE, after which no changes or refunds can be made. There is only one permit per group, though photocopies, screenshots, or photos should be shared with each Group Member, as groups often split up once on-route. Can I change Group member names after the permit is purchased? Yes, you may change the names of the Group Members up to 7 calendar days before your climb if the permit has not yet been printed or downloaded. However, the Permit Holder name cannot be changed at any time. The permit can only be printed or downloaded ONCE, after which no changes or refunds can be made. If the Permit Holder anticipates group members changing, they should wait to print their permit until their group is finalized. Can I cancel my permit for a refund? The entire permit or individual Group Members included on the permit may be cancelled up to 14 days before the date of your climb for a refund of $15/person, and the permits will be available for re-sale within 24 hours. The $6 reservation fee cannot be refunded. If you cancel your permit or individual Group Members included on the permit between 14-7 before the date of your climb, you will not receive a refund. It is encouraged to cancel any permits or individual Group Members included on your permit you know will go unused, so they can go back into the system for re-sale for others to enjoy. Permit cancellations made within 7 days before the climb date will not go back into the system for re-sale. Can I change my group size once I've purchased the permit? The number of Group members may be increased up to 2 days before the date of your climb, provided permits are available. Groups may not exceed 12 people. The number of Group members may be decreased up to 7 days before the date of your climb, and those permits will be available for re-sale. A refund will only be provided if cancellations are made before 14 days before the date of your climb. Group Member cancellations made within 7 days before the climb date will not go back into the system for re-sale. The permits are all sold out for the day I want to climb. What are my options? Keep checking! Permits may be available for re-sale within 24 hrs after they have been returned. Who do I contact if I am having problems with my transaction or recovering my permit? For all permit transaction, email confirmation, or other permit-related questions, contact Recreation.gov using the Help Center search tools or Contact Us links on their website. Is a parking permit included with my climbing permit? No. Recreation Passes (aka parking permits) are not provided with climbing permits. You will need to purchase a Recreation Pass for each vehicle parked at the trail-head. A Washington State Sno-Park Permit ($20/day, $40/seasonal) is required for each vehicle parked at the Marble Mountain Sno-Park from December 1 to April 14. At this time, no recreation pass is required after April 14. Sno-Park permits may be purchased online or at various retailers. Oregon Sno-Park Permits are not accepted at Washington Sno-Parks. Recreation Passes accepted at the Climber's Bivouac are: a National Forest Recreation Day Pass ($5/day cash or check at the trailhead), an Annual Northwest Forest Pass (National Forests in WA and OR only) ($30/year), or other inter-agency passes, such as America the Beautiful ($80/year). Day passes are also available for purchase on-line . Who needs a climbing permit and when? Permits are for any person, of any age, intending to climb the volcano with Closure Area #2 as designated in this map with their boots on the ground, all year long. If you are climbing between April 1 - October 31, the number of climbers is subject to a quota, outlined below. You are also required to self-register at either Climbers Bivouac or Marble Mountain Sno-Park’s climber registers for Search and Rescue purposes. Small children to be carried by their parents or guardians for the entirety of the climb do not need to purchase climbing permits. November 1 - March 31: Unlimited. Free with self-registration at the trailhead. Why do I need a climbing permit? The reason for a permit system is, and always has been, to protect natural and cultural resources and special biological communities within the closure area, as well as public safety. Permits help the Forest Service manage climbing opportunities for the benefit of the public. What does the $15 from my climbing permit help support? The U.S. Forest Service receives the permit fee of $15, which supports trail and site maintenance, Climbing Ranger staffing, and climber safety. Recreation.gov receives the $6 reservation fee. 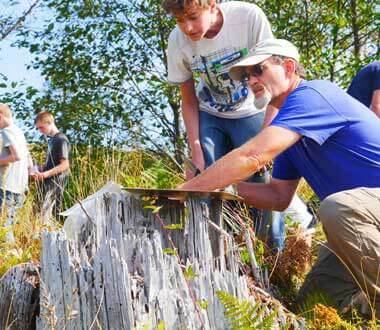 What is the Mount St. Helens Institute's role in Mount St. Helens Climbing Permits? 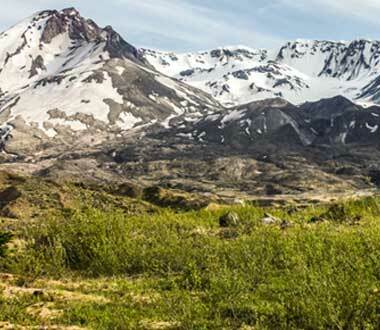 Mount St. Helens Institute provides climbing information, education, and resources for climbers and other outdoor enthusiasts. In addition, we train and support volunteers on the climbing route and at lower elevation trails within the Monument. Learn more or become a volunteer HERE. Climbers may ascend to the rim from a variety of trailheads, but for nearly all climbers there are two primary access points and ascent routes. Each offers parking, pit toilets and limited primitive campsites but no running water nor trash service. For a more detailed description of each route, visit our Route Descriptions page. Climbers Bivouac Trailhead (Monitor Ridge/Summer climbing route) : Generally available late June through October depending on snow conditions. Accessed off Forest Road 81. Trail is called Ptarmigan Trail #216A and merges into Monitor Ridge Trail #216H. Climb is 10 miles round-trip and has 4500’ elevation gain. You need a Northwest Forest Pass or Inter-Agency Annual Pass. There is a composting toilet at approx 2.25 miles at the tree line, where it intersects with the Loowit Trail. Marble Mountain Sno-Park (Worm Flows/Winter climbing route) access: Generally November through late June when snow forces the closure of the road to Climbers Bivouac. Marble Mountain Sno-Park, off the 83 Road, is available year-round (unless snowfall is unusually high). The access trail is #244. The climb is 12 miles round-trip and has 5500’ of elevation gain. You need a Washington State Sno-Park permit from November 1st to March 31st. Where can I stay the night before the climb? Limited primitive camping sites are available at both Climbers Bivouac and Marble Mountain Sno-Park. You must display a National Forest Recreation Day Pass ($5/day), Annual Northwest Forest Pass, or an Inter-agency Annual Pass on each vehicle parked at Climbers Bivouac. Vault toilets are available at each site; there is no water or other amenities available. Campers are expected to obey all USFS policies and restrictions regarding open fires and stoves. If do not wish to camp, we recommend staying near or around Cougar, WA or Woodland, WA. When do I need a Sno-Park pass to park at Marble Mountain Sno-Park? You need a Sno-Park pass to park at Marble Mountain between November 1st and April 14. It depends on a multitude of factors. The average time of a summer climb (with no snow, leaving from Climber's Bivouac) is about 4.5 hours up and 3.5 hours down for a round trip total climbing time of 8 hours. The average time of a winter climb (with snow, leaving from Marble Mountain) is about 6 hours up and 4 hours down for a round trip total climbing time of 10 hours. If there are avalanche warnings, is the mountain closed to climbers? No. The mountain is ONLY closed to climbers (and everyone else) if the mountain is experiencing extreme volcanic activity. It is never closed due to avalanche danger/warnings. All climbers who choose to ascend when snow is on the ground are advised to have proper avalanche training and tools before they venture on slopes of Mount St. Helens. Avalanches can and do occur in the winter, spring, and early summer months. Is the climb suitable for young children? It depends. The climb is much more difficult in winter conditions and turns into an extreme hike in the late summer. The climb is not suitable for anyone who has bad balance or is incapable of taking care of themselves. Age is less of a factor. It depends on the child’s maturity, coordination, and stamina. For all first-time or new climbers, we recommend prior successful experience on trails that approximate the 9-11 miles round trip and 4400’ - 5500’ elevation gains of the summer and winter routes, respectively. Can I bring my dog on the climb? Yes, though it is not recommended. All pets must be on a six foot long leash. Beware that volcanic rock and ash as well as snow and ice areextremely abrasive on a pet's paws. We do not recommend bring your pet along for this reason. Please respect your animal. If you do bring your dog in snow conditions, consider having them trained to accept booties; ice is very abrasive to the pads of dogs’ feet. When do I need an ice axe and crampons? Climbers should carry an ice axe and crampons when the possibility of winter conditions or steep snow travel exists. 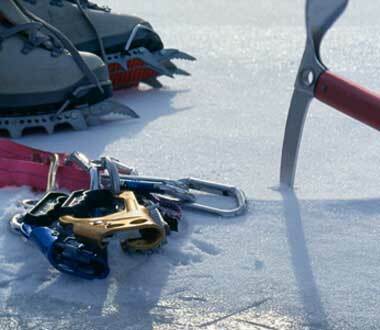 Note: ice axes and crampons are sharp pieces of equipment and can lead to injury if used improperly. If you don’t know how to use these properly, consider climbing later in the season (once the snow has melted), taking a training class from a mountain guiding organization, or joining us on a guided climb! Where can I rent crampons and an ice axe? You can rent crampons and ice axes at many climbing stores. In the Portland area, we recommend The Mountain Shop, Next Adventure, Oregon Mountain Community, and REI. Again, we recommend that you already know how to use these tools proficiently before you ascend the Mountain. Other preparation questions? See our page on how to prepare for your climb.